recruitment 2017. Available vacancies are PGT Physics, TGT, Librarian, Laboratory Attendant, Watchman, Sweeper, Electrical Assistant, Peon and Gardner Jobs. Candidates who are interested in above said posts they can apply on or before 10-12-2017. Along with application form attach the required documents. It is mandatory for the candidate to submit the application form to the Tribal Development department, Ambikapur, Surguja. 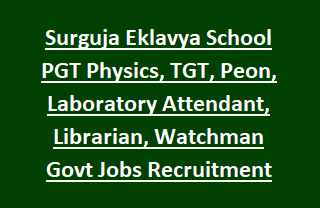 More details about these Surguja Ekalavya Schools vacancies are given below. As on 01-07-2017 candidates age limits are 23-35 years for PGT jobs and for all other posts 21-35 years. Initially candidates will be shortlisted based on their experience and marks percentage. Shortlisted candidates have to attend the interview as per given dates on official website of surguja.nic.in. If you are interested in this recruitment of surguja district, then submit your application form to Surguja District Tribal Department on or before 10-12-2017. It is mandatory to submit the supporting documents alongwith application form. Download Application form and notification for Surguja District Manipat Eklavya School Vacancies.